Prominent & Leading Distributor / Channel Partner from Ahmedabad, we offer atc 155 port powered rs-232 isolator, atc-106 rs 232 to rs 485 interface converter, atc 109n data repeater, atc 131 port powered rs-232 isolator and atc-107n industrial rs-485 to rs 232 converter. Available with us is an outstanding range of ATC-106 RS 232 to RS 485 Interface Converters. The offered products are available with us in different specifications, suited to the defined parameters of the industry. Furthermore, longer service life and excellent performance are the key factors owing to that these products are being highly demanded. These products are being fabricated by making use of supreme quality required raw material procured from the established vendors of the industry. 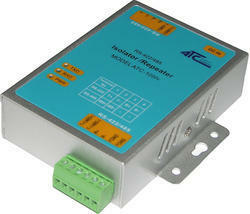 ATC-109N data repeater is a kind of data relay communication product of photoelectric isolated RS-422/RS-485. It can be used with ATC-108 Photoelectric Isolation Interface Converter in combination. ATC-109N data repeater can prolong the communication distance of RS-422 /RS-485 bus network and increase the number of RS-422/RS-485 bus network devices. The inner circuit of ATC-109N Photoelectric Isolation Data Repeater can detect data direction and switch to control it automatically, conveniently to form a RS-485 network without any shake hand signal. This kind of RS-485 control is fully transparent and need not amend software for the former network basing on RS-422/485 working modes. The built in photoelectric isolator and DC/DC converter can offer 3500V isolation voltage and the rapid Transient Voltage Suppressor (TVS) can effectively inhibit lightning and ESD, provide 1000W lightning strike and surge protection power on each line, and prevent lightning strike and common code interference. ATC-107N Isolation Interface Converter is compatible with RS-232C, RS-422, RS-485 standards and capable of converting single end RS-232 signal into RS-422 or RS-485 signal of balanced signal. The built in photoelectric isolator can offer 3500V isolation voltage and the rapid Transient Voltage Suppressor (TVS) can effectively inhibit lightning and ESD, prevent lightning strike and common code interference. 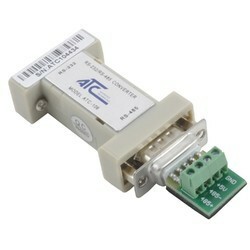 Connect PC, IPC, or portable computer via a DB9 female connector at RS-232 interface, and connect RS-422, RS-485 end via convenient 4-bit terminal. The RS-485 supports dual-line half duplex. The inner circuit of ATC-105 Photoelectric Isolation Interface Converter can detect data direction and switch to control it automatically, conveniently to form a RS-485 network without any shake hand signal. This kind of RS-485 control is fully transparent and need no software amendment for the former working modes basing on RS-232. ATC-107N Photoelectric Isolation Interface Converter can provide credible connection for point to point, point to multi-point communication. 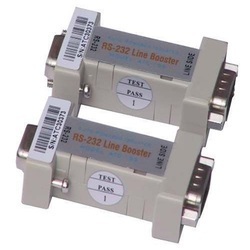 The point to multi-point allows connecting 256 RS-422 or RS-485 interface devices with data transmission speed of 0-115.2KBPS. The 3 power supply and data flow indication light can indicate malfunction. It supports communication modes including RS-232C to RS-422, RS-232 to RS-485 conversion.